In the last article Add Record to Multiple Chatter Groups – Parsing Multi-Select Picklist fields (Flow) I had discussed the way through which you can Parse Multi-select picklist or Multi-select check-boxes and store Parsed Ids into a collection variable. 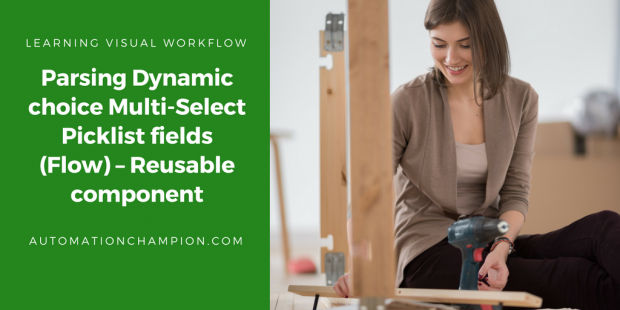 In this article, I am going to give you a reusable component (Flow) that you can use to Parse Multi-select picklist or Multi-select check-boxes. You have to install this component (Package) in your org, after installation you can use it. Tamara McCleary is working in Universal Container as a system administrator. After user creation, she has to spend few hours to add the user to multiple Public groups. Now she is looking for an application that allows her to add new users to multiple Public Groups without moving to screen-to-screen. Note :- For Mismatching Versions error please refer this thread. I have successfully installed this package into multiple org those are upgraded to Spring’15, as I have created it from Spring’15 pre-release org. To solve this requirement we will use Visual Workflow, and then we will embed Flow to a custom link. Before proceeding you have to understand Group and GroupMember objects in Salesforce. Group :- This Group object represents Queue and Public Group both. Groups are sets of users. A Group can contain individual users, other groups, the users in a particular role. By using Type field you can distinguish between Queue and Public Group. For Public Group (Use Type = Regular) and for Queue (Use Type = Queue). GroupMember :- Represents a User or Group that is a member of a public group. Note:- In this article I will only discuss about adding user into Public groups . In similar fashion you can develop a flow for the Queue. 10. Save the flow with name Add User to multiple Group and close the canvas. 3) Add custom link into the User Page Layouts. 4) Navigate to the Group related list available on detail page and you can see user is added to all of the selected groups. I’ve tried a variation of this where I am creating new records rather than doing what you are suggesting here. When I create the records, it seems as thought I am limited to naming the records with just 18 characters, and then if more, the characters are pushed into the next record and created there. Basically, I have a custom metadata type, which I am using to create the choices. From the selected choices, I wish to create a record which is associated to the record from which the flow is running from (In Lightning). I can’t access your flow to modify. Can you advise? Thank you so much for taking the time to post this, it works perfectly and really just saved me a lot of frustration. Thank you. I will give this a try and let you know how it turns out. Your app works great, Rakesh. Thanks so much for making this available. I’ve got your plugin working properly but now I’m struggling with the multi-select choice values being retained as I pass through a loop. Is there a way to clear the values so that the checkboxes don’t show up checked off the next time through the loop?